Tourism Victoria has launched the latest phase of its “Jigsaw” campaign, with creative designed to lure Australian travelers to Melbourne. The tourism body launched its year-long campaign “Play Melbourne” yesterday nationally with television, cinema, radio, print, out-of-home and digital activities. The campaign aims to invite visitors to the southern capital by selling its creative sub-culture. As part of the campaign, a promotion is being run by Tourism Victoria that will see it give away a weekend away in Melbourne every week for the next year. The competition is in conjunction with Austereo and Virgin Australia. The campaign is the latest phase in Tourism Victoria’s “Jigsaw” campaign, devised by agency Publicis Mojo. 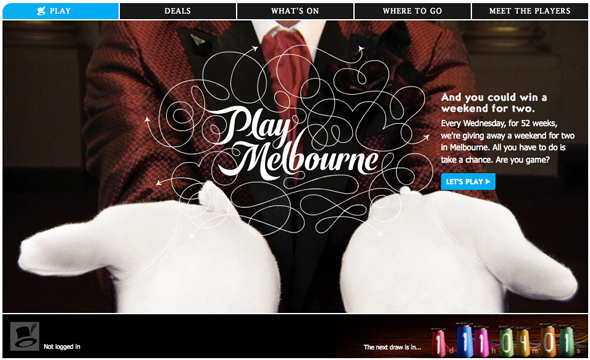 The website for Play Melbourne gives visitors a chance to win a weekend trip to Melbourne for two, with quirky questions and quizzes hiding along various corners of the main Play Melbourne website. Currently, the tourism body is pitching out its creative account with a contract period of four years. It is at the second stage of the process with seven shortlisted agencies presenting earlier this month. Publicis Mojo will be defending the account after an 18-year tenure. Tourism Victoria spent $4.4 million on main media in the 12 months to March 2011, down from $6.5 million in the prior period, according to Nielsen. The campaign will launch in New Zealand next year with Mitchell & Partners handling media buying for Tourism Victoria. In 1496 Christopher Columbus declared it the most beautiful island he had ever seen! The charm of Cheap Dominican Republic holidays attracts millions of visitors every year.